Another taste us Greeks have adopted from the orient, halva is known throughout the Balkans, North Africa, India, Pakistan, Afghanistan and of course the Levant where it originated. Halva is a dessert rich in history, rooted in the medieval Arab world and tinged with a Persian influence. 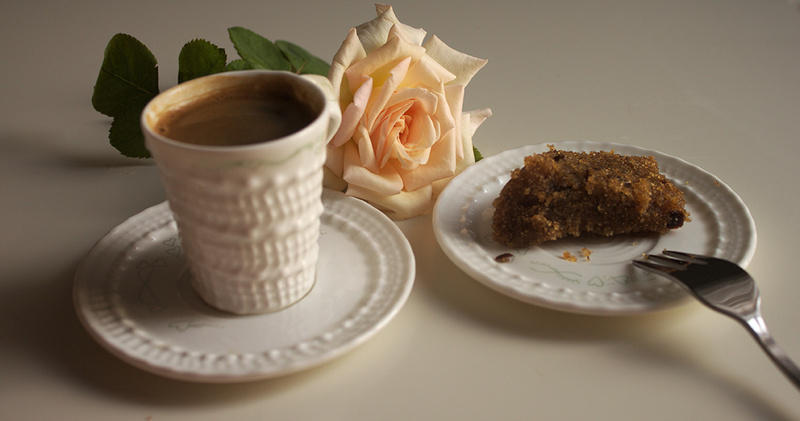 Perfect with tea or coffee, halva has seen many a glorious day. It used to be served to high-ranking Ottomans during their ostentatious banquets, usually with tea, pickles and other delicacies; what a delicious tea service that must have been! There are innumerable variations of this dessert, you can add pine nuts, almonds, pistachios, raisins, dates, chocolate, butter instead of oil, lentils and carrots, rosewater or orange syrup, honey, spice it up with a little cinnamon, or cardamom, or even crocus. In Greece we categorise the different halvas into three main types: cheese, flour, or seed-based. 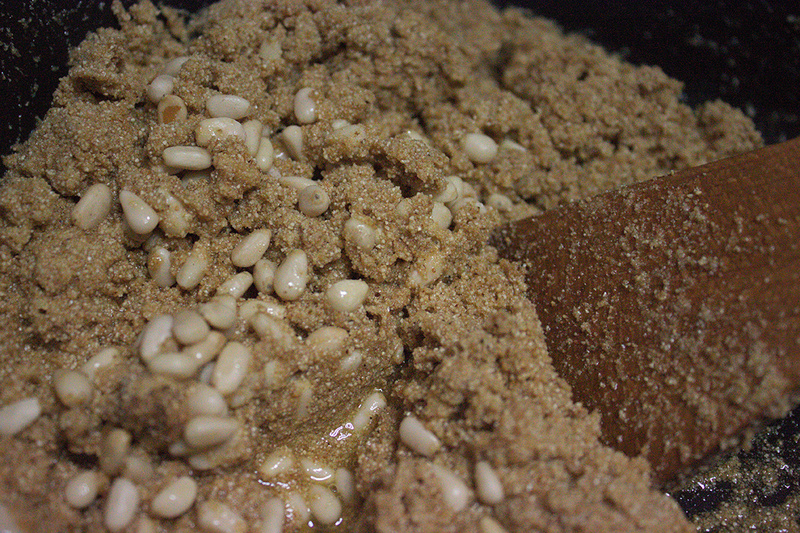 The most common homemade halva is flour-based, with semolina flour. It is a very traditional dessert, eaten to celebrate life and death, and used to be served on Christmas and New Year’s Day. 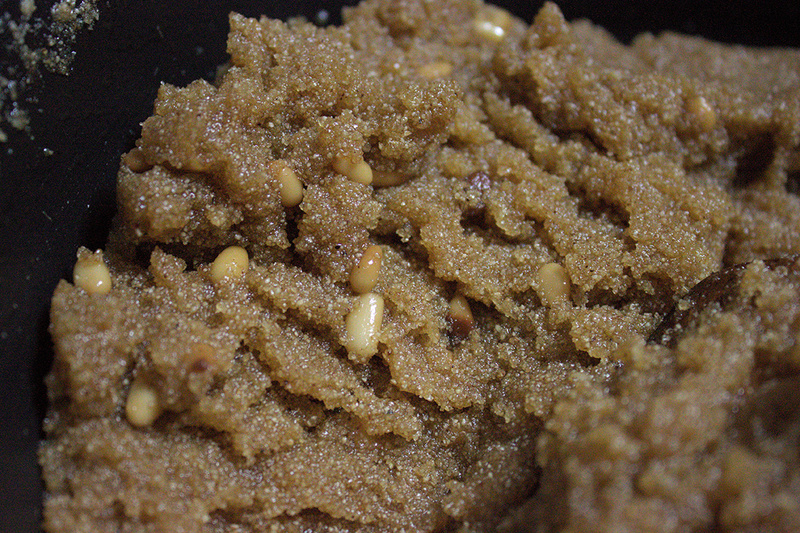 Halva is still popularly associated with lent, yet doesn’t garner the popularity it once had. Nowadays it is pretty much a grandmother dessert, but to me, halva is an extra-special comfort food. Halva also makes a great breakfast as it’s very nutritious, do be careful if you are on a diet though. The best thing about halva, except for its sweetness, is that it’s dead easy to make. All you need is the 1-2-3-4 method, making this perhaps the easiest recipe to remember. For this recipe you start from the bottom, 3&4, to make a light syrup. Dissolve the sugar in water and let it boil for 5 minutes. 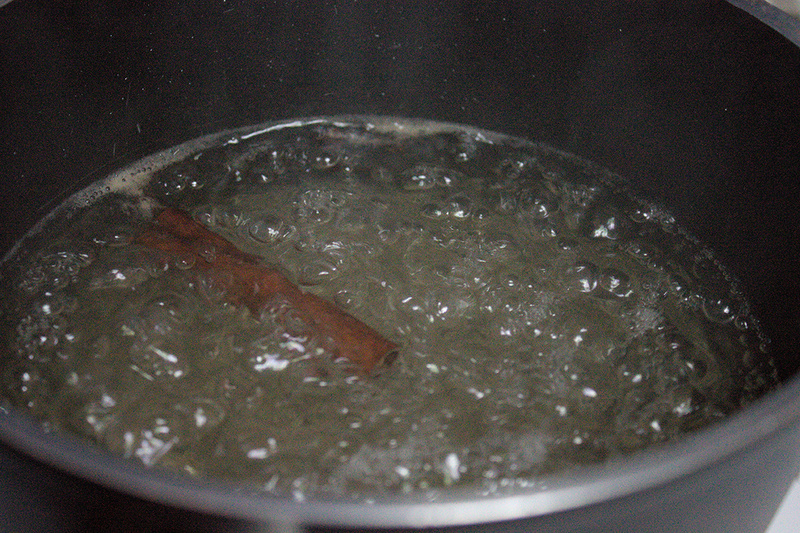 Also, add the cinnamon stick, cloves and orange or lemon peel to impart their aroma to the syrup. Now steps 1 & 2. 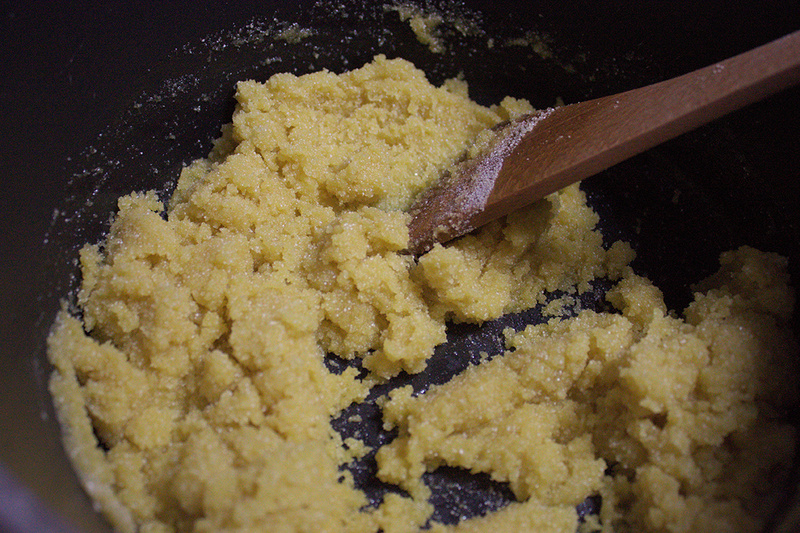 Use the deepest pot you have to heat your olive oil (a little) and add the semolina flour. Be very careful, if it is very hot it will turn into a little volcano erupting on your hob. Keep on stirring with a wooden spoon for about 6 minutes until browned. You are ready for the nuts, add almonds or pine nuts (or both) to the browned semolina and let them brown a little as well. Now everything is ready to combine. Take the pot off the hob and use a ladle to pour on your syrup, one ladleful at a time. It should look like this. 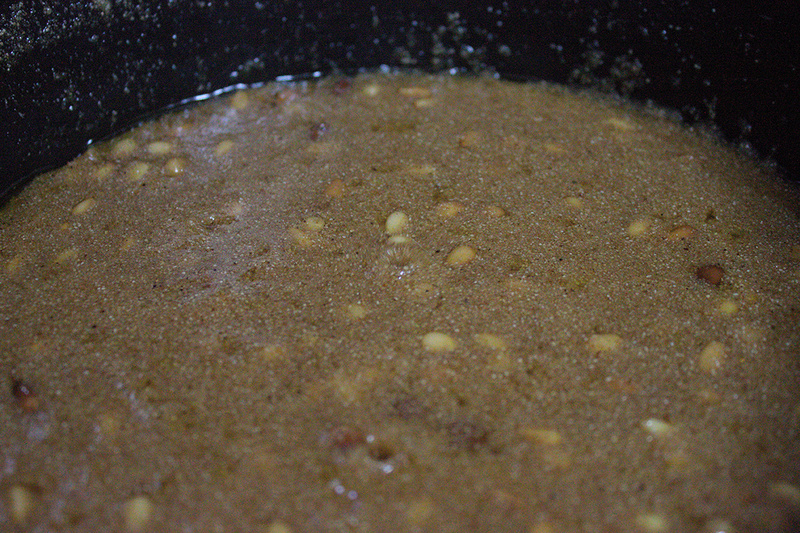 Place the halva back on the hob and keep on stirring until the mix no longer sticks to the pot. Spoon out portions into your choice of receptacle, to shape each serving, and let it cool down.